Today I Went To Work With My Husband To Help Him Move Ladders And Stabilize Things For Him On The Really High Spots. 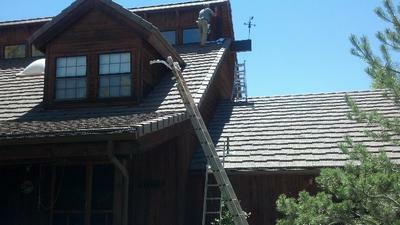 ( He Is A Painter And Is Staining A 2 Story Cabin With Really High Gables)! I Set My Cookers Up And Cooked Pizza Bites For Lunch And Garlic Chicken For A Chicken Curry Salad For Dinner. Had Plans For More But But it Got Really Windy And We Had A Short Day Because It's too Scary To Be Up In High Places In Winds. And Also, My Oven Didn't Like To Stay Upright. But We Had A Good Lunch And Dinner Was Yummy Too! Next Week We Will Try Again. I Think Hubby Might Have Liked Having A Hot Lunch Instead Of A Cold Sandwich. And We'll See How Long He Stretches This Job Out So He Can Enjoy Hot Lunch!